Join the discussion on our forums! Come discuss Hydrologist over in our dedicated Hydrologist discussion topic. Interesting and fun card. None of the paladin secrets are worth a card on their own, but adding a body makes it worth. Flexible, interesting, fun. Value? Kodo. Tempo? Get Down. Deathrattle or divine shield minion, or a confusing Get Down? Redemption. Opponent at one HP and no healing? Eye for an Eye. Deter a key turn from your opponent? Repentance...maybe. 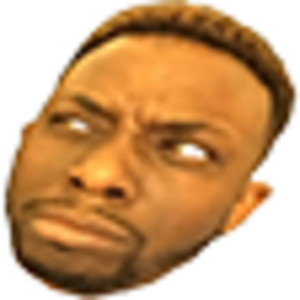 damn you hydrologist I'm permabanned from playheartstone for using cmonBruh. Yo african american! I've done it! This fish frog gets an eye for an eye every time, and you could be too! 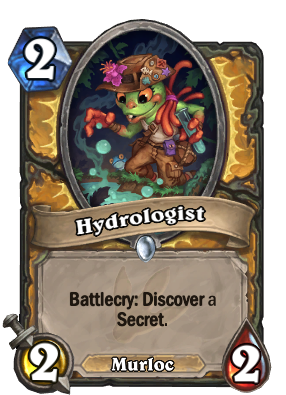 Let's say I play Grimestreet Informant while playing Warrior, and I pull a Hydrologist. What secrets do I discover? Paladin? Anyones? None at all? 9 times out of 10 you want a getaway kodo, but having two other choices is still nice. This is one of those cards that was called weak before Un'Goro's release, and now it's one of the better two drops in Paladin. The thing is, this card is not bad or weak at all; it's actually quite strong. Paladin secrets can honestly tip the game in your favor if played at a crucial moment, and with the pool of Paladin secrets being rather shallow it means that you're getting either the exact secret you need or at least the second best. Not having to take up card slots for a secret while still being able to play them, alongside a reasonable body for the mana cost, is fantastic. Overall I think this is one of my favorite cards of the expansion. A properly statted Murloc that generates high value at a low cost is nothing to scoff at. that is the reason why I love this card, most paladin secrets on their own are terrible, but when you have the choice and the proper moment, they can become quite playable. Is it just me or does he say.... "Yo N..." when he enters?